Have you been struggling with joint or muscle pain? Maybe a college sports injury has left you in pain for years, or carpal tunnel is a nasty side effect of endless typing. What if all that pain could go away and you could start living a normal life again? Andy Shetterly has been helping people in pain since 1987. Through Peak Performance Sports Therapy, Shetterly treats athletes, post-operation patients, and others with a variety of therapies to relieve people of their everyday pain. Shetterly is able to relieve clients of their pain through neuromuscular therapy. This therapy involves targeting trigger points, adhesions, and scar tissue to get rid of pain. Two forms of therapy that Shetterly oftens performs are Selective Functional Movement Assessment (SFMA) and Active Release Technique (ART). SFMA allows Shetterly to see specific restrictions in your body. If you are having ankle pain, and Shetterly asks you to move it a certain way, he will be able to see that the ankle pain could possible contribute to back pain. He can see the restrictions and complication patterns in your body. ART focuses on increasing the relative motion by relieving adhesions. 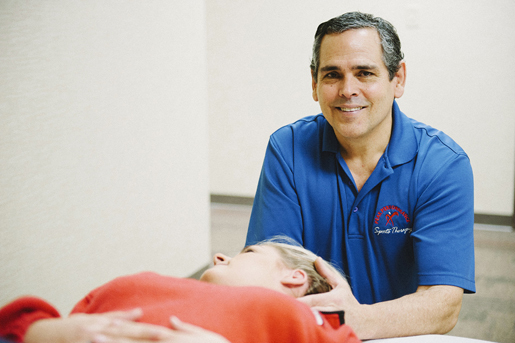 Shetterly has a military background, and when he was stationed at the Marine Corps El Toro as a C-130 Pilot, he began to study massage therapy and body work. He developed a passion for helping people rid themselves of pain and perform to their highest potential. In three to five sessions lasting an hour to an hour and a half, Shetterly can treat anyone experiencing unnecessary pain and help them to start feeling better. Through these sessions, Shetterly can take away years of pain and treat you like a world class athlete. Shetterly is also a certified Titleist Performance Institute (TPI) medical practitioner, where he works with golfers to ease them out of pain and help with their performance. He is also looking forward to connecting with different physicians in the future and forming relationships with them and their clientele to help them live pain free. For more information on Peak Performance Sport’s Therapy or to schedule an appointment, visit their website.